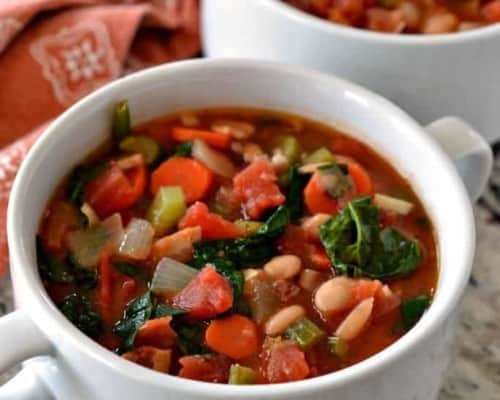 Tuscan White Bean Soup is a delectable medley of white beans, bacon, tomatoes, onions, celery, carrots and spinach in a perfectly seasoned broth. In a large Dutch oven or heavy stockpot over medium cook chopped bacon crispy; stirring frequently. Add chopped onions, carrots and celery. Cook until the onions and celery are soft. Approximately 5-7 minutes; stirring several times. Add the garlic, cayenne pepper, onion powder and majoram; cook 1 minute. Add the drained beans, tomatoes and chicken broth. Simmer for 15-20 minutes. Stir in the spinach the last few minutes of cooking.